Brentford have postponed their Championship match at home to Birmingham City next Tuesday in order to re-lay the pitch at Griffin Park. The Bees confirmed earlier this week they intended to replace the playing surface after it attracted criticism after Saturday's 2-2 draw with Ipswich. The Football League have agreed to move the match to Tuesday, 29 September. The club said the works were the best way to ensure the pitch is "at a high standard" for the rest of the season. Head coach Marinus Dijkhuizen described the pitch as "a disaster, awful and unbelievable" after their draw with the Tractor Boys. 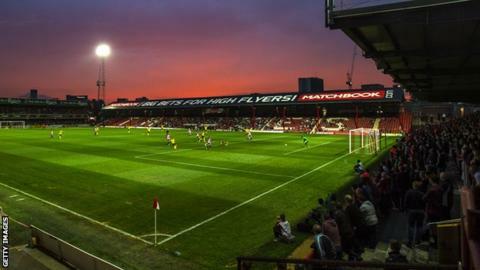 The problems at Griffin Park arose after the installation of a new under-soil drainage system over the summer, and chief executive Mark Devlin said "far more damage" was caused to the pitch than expected. The Bees approached the Football League on Wednesday to ask for the match to be re-arranged, and Birmingham also agreed to the switch. The postponement allows Brentford two-and-a-half weeks to carry out works before their next home game, scheduled against Reading on Saturday, 29 August. "The club would like to apologise to any supporter inconvenienced by the change but I hope all fans understand that this is the best solution in the circumstances," Devlin told the club website. "We would like to thank Birmingham and the Football League for their cooperation and understanding on this issue. "Staff will be able to refund anyone now unable to make the rearranged date."